“The Grind” criteria take a more authoritative impact on the quality of coffee taste. Grinding coffee beans is an important step used for having a great cup of coffee. A big percentage of people starts their daily morning with a hot cup of coffee. To have the best quality, we need maintaining the top quality of coffee appliances too. How to Grind Coffee Beans without Grinder? Now I will discuss one by one which will be easy to understand for your selection. 1) Blender: Can I grind coffee beans in a blender? Yes, this option is the preliminary of the coffee grinding. It is very similar in style to a blade coffee grinder. Although it varies within one minute you will get your desired amount of coarse grind coffee. A blender is perfect for grinding coffee in a pitch, but it has some drawbacks too. It is not providing consistently or fine to grind. Furthermore, it’s great for consuming the coarse grind of coffee. 2) Food processor: We need transferring the coffee beans to the food processor. Using some fixed seconds like 10 to 20 seconds to grind the coffee. This is how we need to check the consistency of the ground processing until we get the desired form of coffee. Like the previous one, it will also give a coarse grind of coffee. We have to notice one thing that after using the food processor, we should clean the container. Otherwise, the smell of coffee will last long. 3) Mortar and Pestle: It is time to back onto the classic phase. You can also grind your coffee with a mortar and pestle way. In many features, this is the best way to grind beans. But it will take some patience and practice also. We should use one hand to the protection the top of the mortar so that no beans jumping out. Moreover, on the other hand, swirl the pestle around the mortar. This is how we should repeat the swirling and hammering until we find the exact shape of coffee. Although, in some time, it will feel annoying. To keep the resistant to the coffee oils, it is better to use a ceramic set. 4) Hammer: Another great way of grind coffee is hammering. For this, we need taking a high-quality freezer bag and place the beans inside the bag of very little air. Both sides with plastic bag should cover by thin towels. This will not let you tear the plastic bag and reserve the bean quality as well. 5) Manual Crack Bean: By using this method, we will get medium-fine grinds. In this process, we need a large size of the wooden cutting board and a large butchers knife. Again, lay the blade flat side of the bean and press on to crack down. To get the finer grind coffee, we have to apply this process again and again. 6) Rolling Pin: This is another free trick to get perfect grind coffee. It is quite similar to the process of hammering system. For instance, put the beans in a thick plastic bag and seal the mouth. Before rolling the pin, we have to confirm that these beans are in a single layer. With gentle pressure on the roll, the coffee bean gets crackdown. We can use parchment paper instead of a plastic bag. 7) Hand mincer: Here I am talking about one of the oldest processes of grinding. Maybe some of you even can’t imagine how it looks. A hand mincer is known as manual grinders. It has used to mincemeat, pasta and coffee bean. This mincer sits at the corner of the table and screwed into it so that it could not move. It made of heavy steel. Moreover, drop the beans into the mouth of the mincer and get started turning the handle. You need to do this several times for having smooth coffee. 8) Frying Pan: The frying pan is another process of grinding coffee. Although not all type frying pan is usable for this. We can apply one and only when we get cast iron based frying pan. In general, there are two ways where consumers enjoy their coffee at home or the office. First one is blade grinders, and another one is burr grinders. We are going to review each. Blade grinder is very much related to a blender or a food processor. These are the cheapest grinders for general purposes and very fast moving blades to chop up. The blades work like a propeller and seated in the middle of the reservoir. Furthermore, the most significant disadvantage will be its quality. It has no consistency about the particles of coffee. By grinding coffee beans into coarse, the taste of coffee can be varied. Sometimes provide powdery dust as well as large chunks. It suffers from the heat too. How fine should you grind coffee beans? Yes, burr grinder- the best way to grind your coffee. Really, this is the best option for anyone. No machine will beat this burr grinder on performance, durability. This grind coffee machine is productive and effective also. Additionally, burr grinders work by “crushing” the coffee beans between the two plates or burrs. It ensures the uniform size. It does not generate heat and give a delicious finished cup of coffee. Which one should be chosen? It depends on some criteria. Again, here, there are two different choices when purchasing a burr grinder. Electric burr grinder is expensive. It is faster in speed too. Again, a manual burr grinder is also less expensive but generates less noise and heat. Here a flat grinder is more consistent with size. As well as provide larger espresso shots. Conical grinders are faster and less expensive. Moreover, due to design, it is less waste and easy cleaning. Conical drip coffee makers are very popular among consumers. So it seems that a conical grinder is a winner but flat grinder has the most consistent grind size. 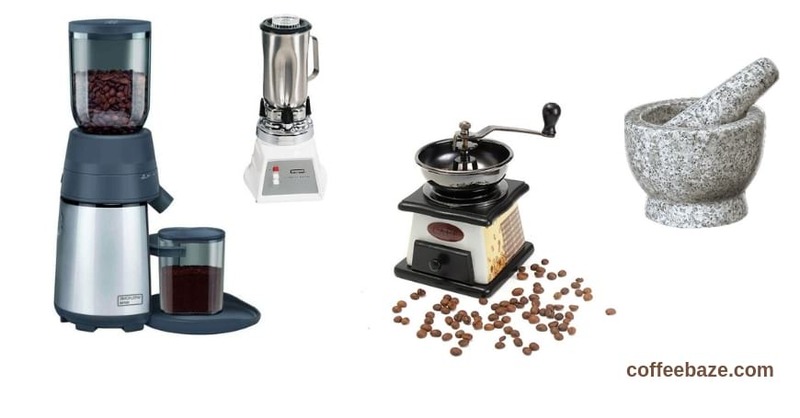 I hope my page “How to Grind Coffee Beans” will help you to understand. As well as, I have given all the related information. It will be more enjoyable and flavorful if you add more time, love and labor. This article can be considered a beginners guide to coffee at home. Lastly, but not least, you have to remember one thing. How you grind your beans direct affects how good your brewed coffee. We have to respect the beans, responsibility of grind and enjoy caffeinated creation.